According to the most credible of websites, Wikipedia says there is a species that can be found in the Caribbean.. still digging for that one. Wow, really? Very interesting. I'll take a look. Those are so cool! Thanks for the hot tip! So it sounds like they are totally doable, in the right tank, and possibly doable in less than ideal conditions. A species tank with a very deep sand bed, would be ideal for their long term health, which is the way I'd prefer to do it. I think I could make it work short term, but I don't think they'd be very happy. Shallower sand beds would work for a while, but they grow. Very tempting! I think I'll file these away for another tank, better suited to them, or if I were to redo this tank. Having a twelve inch deep sand bed would make cleaning the glass so much easier. So cool! With my focus on plants and high nutrients, I should stick to bullet proof, 'beginner' type fish. Like chalk bass. Sounds like you've got a plan thought out. They're a beautiful fish (chalk bass) that I have considered. My concern with them is that basslets are a bit dominant/territorial in their behavior but I wonder what your investigation has turned up. The Caribbean eel is on my dream stocking list too. I believe the poster of that video has wrote an article or two about eel keeping. If I remember, they had bought quite a few and a handful made it (I've heard a 50% initial death rate in captivity is to be expected). The remnant eels did great for a long time. 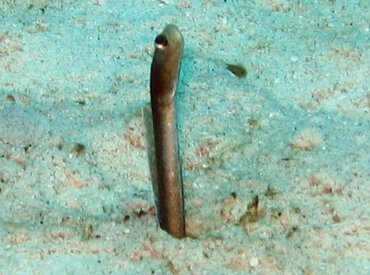 From my reading, even though that genus of eels can adapt to shallower sand beds (L-shaping their body), they are very domicile and easily spooked. In a shallow tank they can easily damage themselves on the tank bottom when darting into the sand. Sounds like that is the leading case of death. Also, they secrete a mucus to firm up sand tunnels and coarse sand/crushed coral aggregates better. edit: the video author's article cited an initial 75% death rate in captivity from a guy named Hemdal. Not sure I'd feel like an ethical reefkeeper buying such a species... I've read Hemdal's thoughts before and he is a firm believer that these species should NOT belong in the hobby. Last edited by JZinCO; 12/15/2017 at 10:33 PM. It's funny, JZinCO, that plan just came to me as I was writing. I read a couple of excellent articles on chalk bass. They do establish a dominance hierarchy but I think if they have enough room, it should work. After giving up on the blue reef chromis, this is my best shot at a blue(ish) Caribbean fish. I was thinking four or five. These fish have been on my list forever, but after I got the grammas, I figured it was too late. Now that I'm thinking about grammas again, it's a good time to reconsider them. Since they are the same size and shape, they really should be added all at once. If my previous experience with the gramma harem is any indication, things may be a little tense for a short time, then they will settle down and hopefully them and the grammas will revert to their natural behavior. The grammas should surf the current along the back wall, and the chalks should cruise along above the sand. I'll think it'll be super cool! Someone said in an RC thread that they might eat grammas, but it looks to me that they are really the same size. I guess if they grew a lot faster it could happen, but it seems improbable. They're kind of an unsung hero in the hobby and considered very hardy-right up my alley. Fewer and smaller sea hares to catch today. Just for fun, I decided to count how many I removed. Seventy. That number surprised me. I would then guess that I've removed over a thousand, over the last couple weeks. I will count them next time too, to hopefully confirm the numbers are going down. Now I wish I'd been counting them all along! My caulerpa is all but gone. This is a plant that grew so fast in my tank I had to prune it weekly-sometimes more. Luckily, sea hares are specialized feeders. They haven't touched my other plants. I suspect I could have just let them do their thing until their food supply was exhausted. Then they would just die off. But the thought of a thousand sea hares dying in my tank isn't very appealing either. So I'll continue to remove them until they are gone. And, I'll try to save at least some of the caulerpa to regrow in my tank. As soon as predation is removed, they should grow back with a vengeance. The 5200K metal halide bulb will be replaced. The wife didn't like it. I was getting used to the yellowish tone, but if I'm honest I wasn't crazy about it either. To me it best resembles the golden light you get at sunrise or sunset. I also wonder if it contributed to my diatom bloom. A quick visit to lightbulbs dot com, and I found a 7500K bulb that looks promising. With shipping it was under 30 bucks. We'll see how it turns out, but on the color temp graph, it looks to be cool white to slightly blue. I think this will be quite pleasing to the eye, and will simulate a little deeper water. With my new plan to get some Chalk Bass, I think this light will really pop their colors, without looking too disco. It's funny how we like warmer light in our homes and cooler light in our tanks. For now, seagrasses and macros remain my focus. I hope to hear of someone trying them, so we can all learn from their experience! I bet the seagrass root structures would make burrowing difficult for a garden eel in the wild. Can you post a 'good' picture of one of the sea hares?? That last picture you posted that supposedly has a sea hare in it was like looking for Waldo, but you don't know what Waldo looks like! I'm sure you probably dream about them being as you pull hundreds out every day, but for those without the experience, we (I) want to see one! If I can find one big enough I will post a pic. But it's unlikely. At this point, they're mostly a quarter to a half inch long. Pretty much all of them are on the back wall, so they're hard to see-and photograph. Basically, they're a small, green nudibranch, that blends in with caulerpa. I do find a bigger one occasionally, so who knows. Sorry for posting about this stuff yet again. I'm tired of it too. Shortly after new years, I hope to get chalk basses, royal grammas, and some new manatee grass. How do you export the hares? Just siphon them out? A petri dish? I know you have a magnifying glass! Take me a picture through the magnifying glass! I think aiptasia is like caulerpa. It’s something you can never fully get rid of. Once you get it, your screwed.. that’s how I felt with the caulerpa in my 26g. That’s of course assuming it’s something you don’t want. Not many people want aiptasia.. Sorry guys, was away from the PC for a few days...I'm on it at work all day. Sometimes, on my days off, I need a break from it. I didn't think Gorilla glue was reef safe. Otherwise, how is it working out? I assume it holds very well. What was the reason you didn't go with cyanoacrylate (super glue)? You can get some really big bottles of that stuff and it is quite cheap. I've used it to glue just about everything that goes into my tank (sometimes there is help from putty). Anyway, just curious here, not saying you did anything wrong. Gorilla Glue is fine as it is inert after it dries. I've read of people using it underwater but did not have good results. Their troubles were with how it dries in water, not the chemicals. I would not use it underwater. I haven't had any problems with it and it holds very well so far. I've had a couple lightly glued pieces come loose. If I do this in the future, I might try the super glue. For anything that comes loose underwater, I'll try the super glue for repairs. Kevin, it must be tempting to keep everything you catch. I know It would for me. JZ, I agree. I think a fish wish list should be done before the tank build begins. I still refer to mine. Yeah, I agree, it's tough. I have a species list as well, and mummichogs were a "maybe" fish for me. From now on, I won't collect them. I will be picky from now on. Michael, I think that the chalk bass would be a cool addition to your tank. I hope that they won't eat your blennies though. That would be my biggest concern. They are a very pretty fish though, and I agree, very much underappreciated. Wow, I didn't realize your were taking out that many sea hares each time. That's amazing. I think your idea of letting them wipe out the caulerpa might work, but there is a risk of them changing up their diet and going after a different macro. I have no idea though, just spouting off my thoughts, certainly not an expert opinion or based on experience. But if you're right, that they only feed on caulerpa, could be the ticket. Slurping sea hares out with a turkey baster works, but it's too inefficient and slow. I use a regular fish net. I flick it loose with the corner of the net, then net it, while it swirls in the water column. They cling to the net, so I don't have to empty it until I'm done catching them. Nobody wants to ship during the holidays, since so many packages get lost. I've talked to a collector, whose going to call me right after new years. I gave him a wish list, so he's going to see what he can get me. I haven't worked with him before, so I don't know how reliable he is. If all goes well, I'll be happy to recommend him to others. I'm most interested in getting Manatee grass from him. Anything else would be a bonus. I probably would get the fish from KP. Last edited by Michael Hoaster; 12/18/2017 at 07:54 AM. Right on, Kevin. It's nice to get away on the weekends! I don't think chalk bass will threaten my blennies, since they were here first, plus I'll start will small ones. The grammas and the look downs were never a problem. Yeah, I didn't realize it was that many sea hares either, until I counted them. In a perfect world, I could control the the sea hares' population, who could control the spread of caulerpa. Unfortunately, Mother Nature doesn't always cooperate! Second day in a row of multiple aiptasia-x sessions. I AM RELENTLESS. I WILL NOT FAIL. Here's a pic of the largest sea hare of the day, It's around 3/4 inch long. The smaller one is close to a 1/2 inch. Imagine them on caulerpa racemosa-not easy to spot. 'Lucky' for me, there isn't much caulerpa left to hide them. Today I caught 35 of them. Half as many as two days ago. 1) Turn off circulation pumps. This is very important and a step I found very easy to forget. No current means no goop gets blown off the nem. 2) As you approach the nem carefully, release just a slight amount, to give it a taste. Done right, it will think it is food and won't withdraw. 3) As it closes its tentacles around the syringe, gently apply enough to cover the whole disk. This prevents the ejection of planula (nem babies). 4) For groups of tiny ones, you can blanket them. 5) Don't turn the pumps on for a while afterwards. They suggest 15 minutes. I go longer. Go after them on multiple, successive days. You always miss some. Do multiple sessions per day. You always miss some. It's demoralizing to finish up, look in the tank, and see ten more. On every session, kill every single one you can find, without exception. No matter how small, every one of them needs to die! Be ridiculously thorough. That's it. I asked my LFS owner today (as I bought my second package of Aiptasia-x) if he had ever been completely successful eradicating aiptasias. His answer was "Sort of. I got it so none were visible for months, then one would pop up at some point." I think I can live with that, knowing that THIS TIME, I will murder any strays IMMEDIATELY. Nice picture! Those are weird... Looks like a garden slug with a nassarius snail tail thingy. Have you been able to positively identify what species it is? I had no idea that sea hares could/would multiply in a tank like that. Are they a different species or will they also get large like the ones I see in the LFS? No, sam.basye, I haven't been able to ID the sea hares. I have looked to no avail. I do know that most nudibranchs are very specialized in their choice of food. Many only eat one thing. Not knowing if it specializes in eating caulerpa racemosa or all caulerpas, I'd call it a Caulerpa Sea Hare. It doesn't even eat ulva. I'm not sure how big they get, McPuff, as I caught the biggest ones first, to prevent more reproduction, and they were easier to spot. The biggest one I saw was around an inch and a half. I suspect they get bigger. I would guess mine reproduced (and survived) because they had a plentiful source of food. If I could have ID-ed them, I may have been able to find their natural predators. No such luck, so I get to play that role. It is pretty cool when something lays eggs in your tank, but thousands of anything, in the confines of an aquarium, is likely to throw off the balance of the ecosystem, or at least destroy a plant you'd like to keep. So, like the Atlantic Blue Tang I had before, these guys have to go. I could just let them exhaust their food supply and crash, but I was hoping to hold onto a fragment or two of the caulerpa to grow it back. We'll see how it goes. Uh, yeah, Sam, that's it! Wow, you found it! Thank you! Now that I know the species name I can find out more. I found a similar one that also photosynthesizes, but it looks more like a leaf. I must have been using the wrong key words or something. I think I used sea hare and nudibranch. Did you use sea slug? Wish I'd have thought of that. I was pretty close on the common name. Caulerpa Slug. Now I've got to go see what else I can find out about it! Yay! Strange little creatures. Pretty cool they can photosynthesize. It would be really cool if you had some of those leaf shaped ones! Hey! You could potentially make some big $$ off those little suckers! There seems to be a lot of good info on these cool little green critters out there, except predator info! Thanks, guys! Wow, I should have posted a pic sooner! That's why I love these forums. We all see things from different angles, and discussion leads to breakthroughs. I can't count how many times I've been stumped and had someone throw out something I'd never thought of. After having no luck with my own research, I'd given up hope of IDing my Caulerpa Slugs. Now, after following sam.basye's request to post a pic, he found it in seconds! I look forward to learning more about theses creatures. I'm also curious to see if any of my deductions were correct. While I love to research stuff, I also like to observe and deduce. Stay tuned! Last edited by Michael Hoaster; 12/19/2017 at 09:51 AM. What would be cool is if you could sustain a manageable number of the slugs like you had with little Zippy to the caulerpa. You'd think there would be a lot more info on them and that they were more common since they reproduce like crazy. I'm kinda curious to know if they can completely wipe out caulerpa..
You should set up a small control tank! That would be cool, Sam! I wish it worked that way. From my experience, it looks like they could wipe out caulerpa. I have very little left. If left unchecked, I'm sure they would have finished it off. What I don't know is whether they would have completely eradicated it. My guess is that they pretty much would, then they would die off, and maybe months later, the caulerpa would come back. That very well may be what happened when I first added it to the tank on startup. Now that I recall, I did see a slug way back then!